Many of the plants you put in your October garden can produce across the winter months into March if you protect them from cold. Choose your garden location carefully to insure sunlight reaches it now that the sun is lower in the sky. As the days and nights get colder, provide the extra warmth radiating from a block fence or wall by locating your garden nearby. Watch nighttime temperatures and be sure to protect against frost by using mulch on the ground and cloth coverings over the plants. (Never plastic.) Lights adding heat under the cloth blankets are also effective. You will notice from this list of plants that we eat the roots (such as carrots, radishes); leaves, (spinach, lettuce, chard); unopened flowers, (broccoli, cauliflower); and stems, (chives) of plants in our cool weather garden. Plant endive, chard, carrots, radishes, rutabagas, spinach, turnips, asparagus, broccoli, lettuce, cabbage and peas. Plant chives, arugula, dill, fennel, marjoram, sage. Plant annuals for color winter through spring, such as, dianthus, geranium, lobelia, petunia, pansy, snapdragon, alyssum, and many more. Mulch flowerbeds well & add a pre-plant fertilizer (6-24-24). Water to a depth of 6-8”, twice a week for temperatures under 90°. Plant brittlebush, penstemon, desert marigold, salvia and globe mallow. Water to a depth of 1 foot, twice a week. Should you use seeds or transplants in your fall garden? With seeds you have to factor in germination time, which is no problem with certain varieties. Using transplants gives you an instant plant, earlier harvest and uniform produce. Planting time is also affected by temperature. Get an early start to allow for seed growth. Seeds do well in warm soil, but upon emerging, the heat may damage the shoots. Starting your seeds in flats and transplanting into the bed when daytime temperatures are less extreme (below 100ºF) is one successful approach. Consult your Low Desert planting chart. Seeds planted in cold soil are slow to sprout, if ever, and they may simply rot. If you get a late start planting, use transplants rather than seeds. Give plants an advantage by starting seeds in flats early then transplanting them into the garden. Take advantage of the wealth of information on the seed packet. Arm yourself with a magnifying glass so you can read the words and charts and learn a few key terms. In the United States and Canada, the growing season usually refers to the time between two dates: the last frost in the spring and the first hard frost in the fall. Specifically, it is defined as the period of time between the average last date at which the overnight low temperature drops below 32 °F in the spring and the average date at which the overnight low first drops down below 32 °F in the fall. Here in the low desert, these dates are intersected by the extreme heat of summer, so that we consider our growing season actually to be two seasons; spring and fall. Days to sprout means days to germination. Seed spacing is the distance in the trench between seeds. Planting depth is the distance from the soil line to the bottom of the trench. Plants not coming up in the time expected may be seeds that were planted too deep. Row spacing is the distance between rows, and this can be greatly reduced by planting rows of root plants between upwardly growing plants. Carefully space the seed within the rows as overcrowding encourages pests (such as aphids attacking broccoli). Trap cropping is planting to attract certain insect pests away from a neighboring plant. Save valuable garden space by planting two types of plants in the same row that will come up at different times. Plant leafy, shady plants so they do not block sunlight from other plants. Save garden space by using a trellis to keep vines off the ground, growing vertically. Position the trellis so it does not shade the rest of the garden. The trellis also can be used as a support for frost protective cloth. Days until harvest refers to the time it takes from sowing seed to having mature vegetables ready to eat. Companion planting refers to the benefits certain plants give others when planted close to one another; such as cabbages and sage; or tomatoes and basil. It is important to group plants with the same water needs together. The garden is easy to weed and maintain if you plant seeds in rows, but don’t plant the whole row at the same time—stagger your planting dates so you stagger the harvest. Learn to freeze, learn to can, and be generous with neighbors. The generous farmer is the prosperous farmer. A succulent, strictly speaking, is any plant that stores water in juicy leaves, stems, or roots to withstand periodic drought. The reduced leaf surface of succulents cuts down on transpiration, which is water vapor lost through the minute pores in the leaf called stomata. There are other water-thrifty succulents, such as jatrophas and dioscoreas, which respond to a limited water supply with a brief growing season, extended leafless dormancy, and storage of extremely infrequent rainwater in their bulbous rootstock. Practically speaking, gardeners of succulents exclude such fleshy plants as epiphytic orchids and include in their garden collections many desert plants (yuccas, puyas) which are not fleshy. Most succulents come from desert or semi-desert areas in warmer parts of the world. Mexico and South Africa are two very important sources. Some succulents come from colder climates where they grow on sunny, rocky slopes and ledges. Some succulents make good ground covers; others can be planted between stepping stones or used to create patterns in small gardens. Many succulents have showy flowers. Large-growing succulents are often used as important focal points in a landscape. Members of the cactus family may have stems shaped into cylinders, pads or joints which store water in times of drought. Their thick skin reduces evaporation, and most species have spines to protect plants againt browsing animals. Flowers are usually large and brightly colored to attract pollinators; fruit may also be colorful and is sometimes edible to people as well as many desert animals. Cacti range in height from a few inches to 50 feet tall. 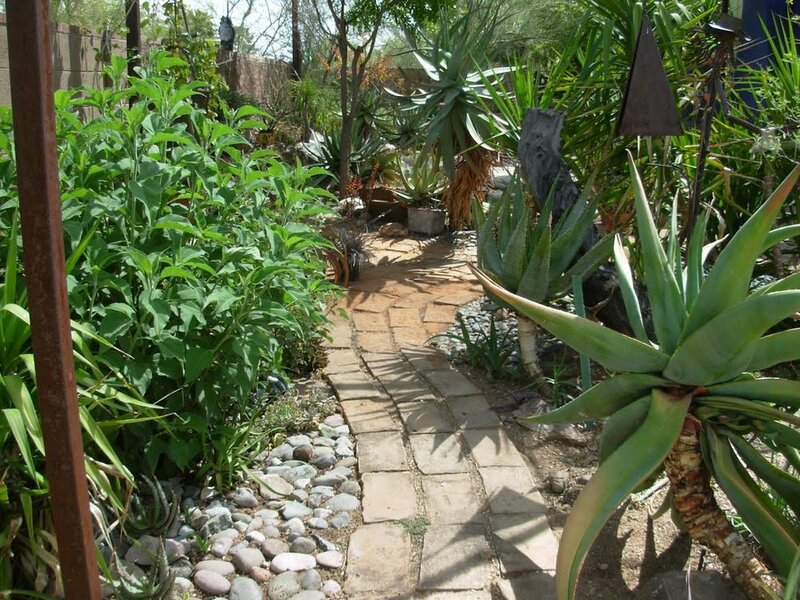 Gardeners use larger species to create desert landscapes. Interesting forms and brightly colored flowers on smaller cacti are perfect for flower pot or rock garden culture. Smaller species are grown in pots or, if sufficiently hardy, in rock gardens. Many easy-care succulents make attractive house or greenhouse plants. Growing conditions in their original climates determine sun exposure requirements among succulents. Bright light is generally required by succulents, with some preferring full sun exposure. However, many popular succulents are native to countries where temperatures are not as extreme and sun not as intense as here in the Sonoran Desert. Large specimens for landscaping must thrive in full sun and well-drained soil. For succulents that cannot withstand full sun, plant them in locations that take advantage of filtered sunlight provided by native trees or shrubs. Some of our Southwest native cacti naturally grow within the light shade of a shrub or desert tree. If a succulent plant receives too much sun, the surface tissue will yellow. You must provide shade, or move the plant to a more appropriate location or the tissue will turn brown, indicating permanent damage. This is why many gardeners keep their succulents in pots which can be moved around during the year for best temperature control and sunlight exposure. Most succulents can be propagated easily from leaf cuttings. Gardeners often plant many succulent cuttings together, displaying them in the same pot with the idea that as the tiny cuttings grow at different rates they will be separated and replanted when they are no longer attactive together. Though you can combine a variety of succulents you must consider their compatibility carefully. Mature size, water and temperature requirements may vary greatly. Use a fast-draining soil mix, such as two to three parts pumice with one part potting mix. Water newly planted cacti carefully: roots are subject to rot before they begin active growth. When new roots are active, water thoroughly, then let soil dry before watering again. Reduce watering in the fall to allow plants to become dormant. Feed and water these plants well during warm weather for good display; taper off on fertilizer to encourage winter dormancy. What’s the Buzz with Native Bees? Did you know that the Sonoran Desert is home to almost 1000 native bee species? Though most people are familiar with honey bees, these domesticated bees were actually introduced to North America from Europe — and honey bees are so widespread they in no danger of extinction. Native desert bees range from the world’s smallest bee (2 mm) to the large and clumsy carpenter bee (nearly 40 mm). Most are stingless, solitary nesters, aside from bumble bees. The majority of flowering plants in the Sonoran Desert are adapted to pollination by native bees. You might find a native bee nesting in a tiny burrow in the ground, inside a hollow, pithy, dried stem, or in existing holes or tunnels in stumps and logs. This nesting habitat can often be threatened, unavailable, or contaminated with pesticides, which has contributed to a significant decline in native bee populations. Unlike social bees, a mother solitary bee prepares a large ball of pollen and nectar to sustain the larva once it hatches, seals the nest chamber, and has no further contact with her offspring. Desert bees are busy in the spring searching for nesting material. Some bees line their tunnels with waterproof wax, while others collect floral oils and resins to help them build nests. You may have noticed circular shapes cut out of leaves and petals — this is a tell-tale sign of a leafcutter bee who requires those pieces to line her nest. Mason bees may take tiny pebbles, water, and mud to fashion adobe-like cells for their young. Your garden will likely see many native desert bee visitors, on their quest for highly-nutritious pollen and sugar-rich nectar. The common cactus bee pollinates prickly pear, cholla, and saguaro cactuses (peek in a bloom and you might spot one coating itself in pollen). Carpenter bees can be found pollinating flowers on agave, tomatoes, melons, desert willow, and even crops such as cotton. Sonoran bumblebees visit snapdragons, sunflowers, and trumpets. Some specialized bees are more picky in their preferred food source, like tiny globe mallow bees, and digger bees that prefer creosote flowers. A third of our crops rely on pollination from bee species. Crops such as squash, broccoli, cabbage, berries, cotton, and citrus are largely pollinated by native bees. Ground-dwelling bees also dig tunnels that are good for aerating soils and allowing water to percolate to roots. Bees provide food for ecosystems by generating fruit eaten by many animals, and by becoming food themselves. Our desert ecology and our agricultural economy benefit from healthy bee populations. If you would like to read more about supporting native pollinators, check out this regional guide for farmers, land managers, and gardeners. Whether you're a budding grower, a master gardener, or simply a fan of fragrant flora, "Cartoons & Roses," the the 69th Annual Rose Horticulture, Arrangement, & Photography Show is not to be missed. Welcome to the All-New Valley Garden Center Website! We are proud to present the new ValleyGardenCenterPHX.org, complete with an updated look and feel as well as a host of new features and tools! Check back soon – we'll be updating this space with information on upcoming events, along with special features showcasing the goings on within our various garden clubs.